Barite is a sulfate mineral with a chemical formula of BaSO4, sometimes called heavy spar. Its chemical name is barium sulfate. It is the primary source of the element barium. It is soft 3.5 on the Mohs scale and surprisingly heavy. Barium sulfate crystallizes in the orthorhombic system in tabular or prismatic form. It can be white, yellow, blue, red, brown, and clear. It has a white streak. It is formed in hydrothermal veins often found with copper, silver, and lead ores. It is also associated with limestone. The desert rose popular with mineral collectors is made up of tabular barite crystals. This mineral has many uses, from the manufacture of paints, cooling the bits in oil drilling operations, and because it is opaque to x-rays it has medical applications. Barite is widespread in occurrence. The Czech Republic is noted for its large and beautiful crystals. 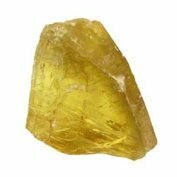 In the U.S. yellow crystals are found in South Dakota, blue crystals in Colorado and colorless crystals from California. Location: Barite is widespread in occurrence.